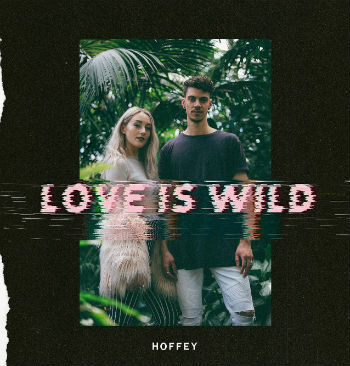 HOFFEY, a male/female pop twosome from Vancouver Canada, recently released their debut single, titled Love is Wild. The often synchronous yet contrasting vocals of Erika and Jordan Toohey complement each other well enough. There are a couple of ways in which this track differs from a conventional pop track though, both of which are positive. For one thing, the artists are genuinely partners in a romantic relationship, which gives added sincerity and meaning to the lyrics and how they’re expressed. This is unlike most common pop songs, which typically are written by third parties and just simply manufactured for public consumption (there are a few exceptions.) The other noticeable distinction here is the unique synth backing on Love is Wild. It has more of the feel of an artistic collage than a standard pop/dance beat. In fact, if this song were released without vocals it could pass for a very good chillwave track. True to the song’s theme, the interesting pacing and unpredictable breaks almost seem calculated to correspond to the tempestuous, yet beautiful wildness of the relationship experience itself.